So don't make another mistake"
Believe it or not, these lines from Heart's "If looks could kill" flashed across my head several times during the process of acquiring my fourth Ennebi. It's a bit of an irony because it was very much love at first sight. Er... I'm referring to the Ennebi in question, of course. Man this watch is a beauty! If looks could kill indeed. It's also the lyrics from the song with the same title, If looks could kill (yeah, I'm an 80's rock fan) that scares the hell outta my skin. When my wife found out about my third Ennebi, purchased a month earlier, the neighbours almost called the cops! You catch my drift? Thus, armed with whatever courage and stealth I could muster, I confirmed my interest on the phone with Gnomon Watches, and mounted a clandestine operation to arrange collection from Gnomon Watches within 12 hours. And yes, the missus still does not know about this watch! The Ennebi Fondale Vintage California Sub (I shall refer to it as the 9626), in a nutshell, is a handsome watch. It's not exactly a sleek Ferrari. It's more subtle. More like a BMW M5, an unassuming scene stealer - big and purposeful. As the name suggests, the 9626 is adorned with a California dial with an oversized Ennebi NB logo. A seconds sub-dial sits at the 9 o'clock position. Under the dial is the classic UNITAS 6497 calibre. Not a high performance engine but one with a long and illustrious history. These are ensconed within a massive and chunky 50mm, beadblasted stainless steel case. Finishing off the facade is a the signature, tri-ridged titanium Ennebi bi-directional bezel. But the conversational, attention magnet has to be the gold skull pip on the bezel. The skull pip is made of 750kt gold. It's not sinister looking but adds a unique, macho touch to an otherwise rather plain face. Broad shoulders flank the "pancetta" crown. Why they have named the crown design after an italian bacon, I have absolutely no idea. In fact it does not even resemble a slice of bacon in anyway. Although the uniquely designed crown adds to the beautiful aesthetics of the watch, it is not easy to use. This is because of the circumference of the crown tapers steeply inwards towards the case. As such, the actual contact surface between fingers and crown is very limited. Thus making it difficult to turn the crown. The ridged sides does not hep much. As with other Ennebies, the 9692 has clean surgically finished curves and lines. The straps are fastened to the case via screw-in bars. A spartan case back adorns the bottom of the 9692 and features the usual essential info like the serial number, model reference and depth rating. Strangely, despite the abundance of space, the signature Tricolore is absent. The watch comes with two pairs of original Ennebi calf straps. Each pair is fitted with the standard engraves Ennebi roller buckle. The lume resembles a signed neon masterpiece that could make the visual artists at Industrial Light and Magic drop their jaw in awe. The short, angled lugs ensure a very comfortable wrist-wrapping fit. Its thickness might need some getting used to for some folks. 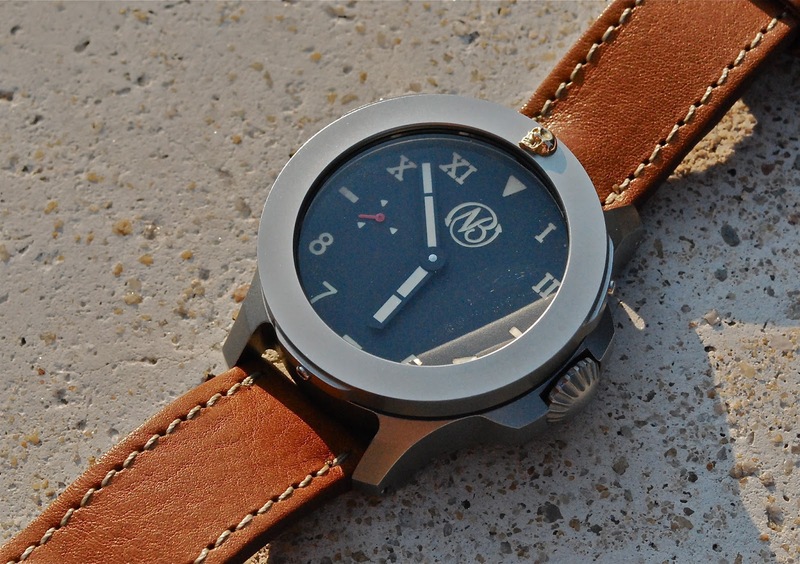 This is a seriously handsome watch. However, most will tend to use it as a casual watch due to its size and golden skull pip. Other than this and the crown, I can't find much fault with this watch. This is truely my favourite Ennebi . Wearing this is like wearing a piece of art on your wrist. Case Material : Beadblasted 316L stainless steel. - Just plain handsome looking. - Common lug width, easy to source for after market straps. - Limited to 33 pieces. - Not easily or readily available. - "Pancetta" crown difficult to use. Hi Richard, I have been reading your blog for the past few days. The watch looks great on you. May I know your wrist size? Does the watch feels heavy on the wrist since the casing is made of steel and not titanium? I'm new to mechanical movements, have a couple of automatic 2824-2. Will there be a risk of over-winding the watch or there's some protection system in place to prevent this? Thanks in advance for your replies. Thanks for your compliment. My wrist size is 6 3/4 inches. Do not worry about over winding. It is very unlikely in a Unitas 6497 and 6498 movement. You'll know it's fully wound cos you won't be able to wind it any further. It's pretty much like an old style wind-up toy. When the spring is fully wound, it's like someone pulled the parking brake. You won't be able to wind any further. Many thanks for the prompt reponse. I couldn't tell that your wrist was that slim. The watch doesn't look out of place on you at all. Mine is about 7.5in so i think it should be fine too. I couldn't find a used one like yours (9692) but managed to find a similar one (9690). I noticed that the watch is using a "Domed organic crystal". How does this compared to the Sapphire crystal in terms of clarity and resistance to scratches. The seller said that there's hairline scratches on the Acrylic Crystal from daily wear. Any idea if this can be polished off? Actually, the watch looks okay on me due to the way i wear it - right smack on top of the wrist joint. All the Ennebies I've reviewed thus far use acrylic crystals. they are not as scratch resistant as sapphire crystals. However, scratches can be easily polished off. I was told toothpaste is one alternative though I've not tried it yet. I have, however, used Polywatch and it works. You can google polywatch.